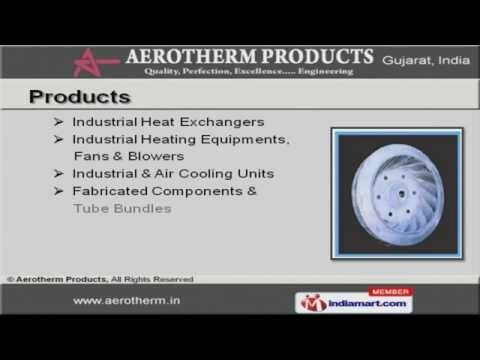 Welcome to Aerotherm Products Manufacturer & Exporter of Heat Transfer EquipmentsWe are an ISO 9001:2008 certified company, incepted in 1986, at Ahmedabad. Our products are applicable in Chemical & Textile sectors. TATA Group of Industries & IOCL are some of our prestigious clients and we arebacked by Diligent workforce & Easy payment options. We offer a vast range of Industrial Heat Exchangers, Evaporators & Vaporizers. Our Industrial Heat Exchangers are well known for their durability. Industrial Heating Equipments, Fans & Blowers offered by us are a class apart. Our Industrial & Air Cooling Units are widely appreciated in the market. We also provide Fabricated Components & Tube Bundles that are extremely reliable. Along with that we offer Industrial Evaporators & Vaporizers that are superior inperformance.